Perhaps you have been wondering why I haven't posted a eulogy to the late Taby Ley Rochereau. Or why I haven't commented on the death of Nelson Mandela. And what are my feelings at the death of prolific producer Ibrahima Sylla? I certainly have opinions about all of these, but in the case of the first and the last this is not the time to express these. And in the case of Madiba: what can I add that has not already been written, by persons far more qualified, far more knowledgeable than me? I simply have nothing new to contribute to the overwhelming sorrow at the death of this inspirational human being. And those who wondered if this blog had come to an untimely end, or if inspiration or motivation had run out, can rest assured that this is certainly not the case. I was merely getting overworked and simply had neither the time or the physical energy to sit down and spend time sharing the wonderful and ever amazing music of the African and latin continents. Inspiration, passion even - just listening to the music you will know that there is very little chance that this will go away. 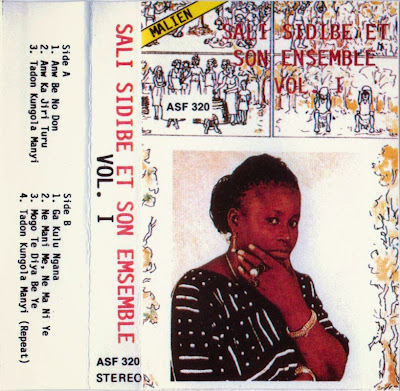 In this post I would like to share a cassette by an artist who has featured in this blog before (here and here): Sali Sidibé. Many of Sali's cassettes are among my favourites from Mali, and this is certainly one of those. It is a somewhat exceptional cassette in that Sali is accompanied not by a 'traditional' ensemble but by a modern orchestra. According to the guitarist Boubacar Diallo the orchestra consisted of members of National Badema (do yourself a favour and listen to their cassette if you have - erroneously - overlooked it). Going by the sound of the orchestra this seems very likely, although I have heard others claim that members of the Rail Band are actually accompanying this great singer from the Wassoulou district in the Sikasso region of Mali. What makes this cassette really special is the authority with which Sali addresses the people of Mali. She does so talking, and this in itself is part of a long and very respected and respectable tradition in Mali. Ms. Sidibé is dishing out advice on all kinds of issues, and particularly issues which would concern those living in the more rural areas of Mali. I particularly like her warnings against tasuma , i.e. fire, in the longest track on this cassette, "Anw Ka Jiri Turu". The song starts of with the sokou (probably Zoumana Tereta) imitating the sound of a fire-engine. In the opening line of her (spoken) message to the public Sali gets straight to the heart of the matter: "tasuma magninde" ("fire is no good"). She continues to point out the places where fire can present a serious risk. In any other country this may sound like kicking in a space where no door has ever been. And I suppose to a lot of Malians too it does sound like she is stating the obvious. But this is also part of her role as a musician. She is confirming the obvious. Fire cán burn you, bush fires cán ruin lifes. So "tasuma maginde". Be careful with fire, think of the risk. But even you have no idea where Sali Sidibé is talking and singing about this is simply a superb cassette with great music. Thank you! Happy New Year, and it is great to see you back. I like Sali Sidibé, I like the style of the blog, but especially I like your aptitude to associate ideas, to suggest Fodé and the Badema Orchestra, that has made me remember a video that we can see in youtube. Sali is wearing (in the 1987 video) the same earrings that in the cassette photo(its appearance is very similar), we can also see the same shirt in one of the chorus girls(daughters? )and also can recognize Zoumana Tereta. Sali is singing in the video Warani jougoulena with her "ensemble", then Fantan ni môné, together with Keletigui Diabaté (Badema? ), and then Fodé, with Kassemadi Diabaté singing the led voice. Great music, as always; and glad to see you still around and blogging it, too. Best of the new year to you--and much great music, as well! It's just not the same without your inestimable input on african music's âge d'or and the beautiful rarities you share. Happy 2014 to you. Thanks for offering such an auspicious beginning to the new year. I'm intrigued that so many of these songs (at least a3, b2 and b4) are echoes of the hunters' song "Djina Mousso". I only remember her using it before in "N'goni Bourama". It's nice no longer having to miss you. Always good to hear something new (to me)from one of my all-time favourite singers. And lovely to hear something from one my favourite blogs too! @Ngoni; Thanks for the addition. As to the guitarist: I would rather put it that Zani played in the same style, which is a style based on the music of the Sikasso region as a whole. I have always assumed that Boubacar Diallo (who has played with Badema, and later with Oumou Sangaré) was playing the guitar. He was the one who told me it was musicians from Badema playing in this cassette, and I assumed that included himself. If not, perhaps Mama Sissoko (not the Biton one)? P.S. : Kungo is not just forest, but is in the Malian situation better translated as "bush". I already sent my best wishes for this year to you here in the blog,but forgot to put my name. I am in the same situation like you in regards to being so busy both at work and home,but hej,it is so nice to have you back. Well I wanted some clue. That Boubacar Diallo, the first Oumou guitarist? I really wanted to imagine Madou Guitar here, but hardly know him. At first I thought Adez Traoré on the flute, but then I doubt if it can be Dramane Traoré. About the forest, if we speak of wasulu, we can use it, (and that other word you suggest me, I prefer not to write it, I've hated). It certainly is not Madou Sangaré a.k.a. Madou Guitare. So glad to hear your voice and your insights. Sorry I rewrite the titles again, according to the order in which they came marked. As usual in some Sali albums, the songs are out of order. I can understand a little bit and I've ordered. I deleted the previous post, because I was also wrong. b2-Mogo Te Diya Be Ye (Can not please everyone. After reviewing a video with Harouna Barry (Director of Badema (1986-2001) with Zani Diabaté, I turn to consider the possibility of Zani guitar. It's hard to imagine Zani guitar contained, but there is so. Listening again, your track a-1, I thought I heard something in the chorus, which can be heard more clearly 5:20 minutes.
" Aye baara Diabaté .... magni, Diabaté mngoni deh baara yuman eh"
I understand in the end, Diabaté on ngoni, does a good job. Good music! Anyway, i'm very glad to see you back Stefan! when back, I can tell more about that tape, that has been produced for "Le service des Eaux et des Forets"
I can't more than wish you a nice evening with that tape. Hi Stefan, I hope you are well. Given your note above regarding sylla maybe this isn't the place to ask - but what happens to the huge catalogue of rights he "owned"?